Are you happy with the results you get in your life right now? How would you describe your health and well-being? What is your plan to enhance your finances? How regularly do you spend quality time with your family? Do you have a great network of friends – people who lift you up rather than bring you down? What life-enhancing experiences (seminars, trips, adventures, sport events, theatre, concerts, meeting your favourite role model) have you scheduled for this year? How mindful are you day in and day out about your interactions with others? Do you feel you have a meaningful relationship with your life partner? You may not want to hear that BUT everything you have or don’t have in your life right now is based on the choices you made in the past. Have you ever noticed that some people always get that bad boss? Have you ever observed that some women always attract the cheaters or some men always gold diggers? Have you ever heard about that person who people constantly take advantage off? 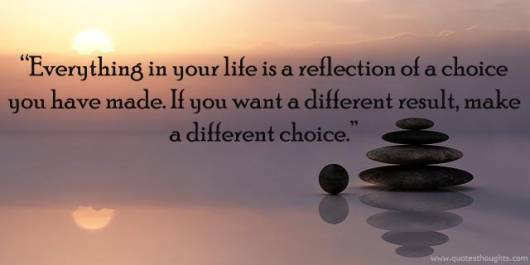 The person is the same but if they always make the same choices, they will always get the same results. Most people are in the passenger seat of life. They are on autopilot and wait what life has in store for them. Life happens to them because they’re not mindful and they don’t have a plan. Today I would like to encourage (=help you to get the courage) to get into the driver’s seat. What would it take to become more strategic about your life and the choices you make? If you want to take a vacation, plan for it. If you want to take a seminar, plan for it. If you want to learn a new skill, plan for it. If you want to meet your life partner, plan for it. If you want to spend more quality time with family and friends, plan for it. If you want to lose weight and become physically active, plan for it. If you want to bring more excitement into your relationship, plan for it. I am a very spontaneous person and I don’t always like to plan but if I want to enhance a certain area in my life, I suddenly become a life strategist. Why not fine-tune your life story by rewriting certain chapters of the script?